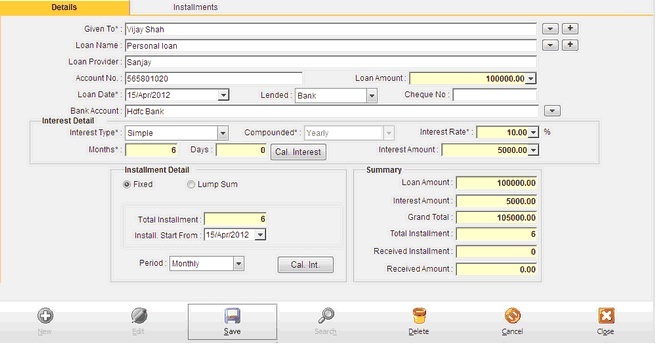 This module helps you to keep a record of the loans that you lend to other entities and works the same as the Borrowed Loan module. Given To Select Provider from list. Loan Provider Auto Fill. Current member come here. Loan Amount See Loan amount here. Interest Amount See Interest Amount here. Total installment See Total Installment here. Received Installment See how many installment you have received. Received amount See received amount here. Installment Amount Installment amount of receipt. Received Date Received date of installment. Cheque No Cheque no of receipt if bank. Receive Account Receive account name select with button. 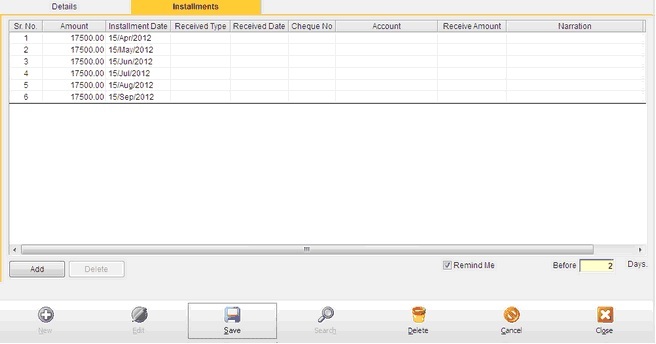 Add Press Add to enter receipt entry of installment. Delete Delete received installment entry. Remind me before days Set reminder of installments before specified days.